They say you can't teach an old dog new tricks, but that doesn't mean he can't teach you. When Catherine Boalch had her first child at the age of 34, she knew nothing. Or so she thought. I had never changed a diaper, never held a newborn baby - in fact, I don't think I'd ever seen one. I hadn't experienced a sleepless night since college, and the only bottle feeding experience I had involved a baby woodchuck. But it turned out I did know a few things about parenting. Things I learned from my dog. 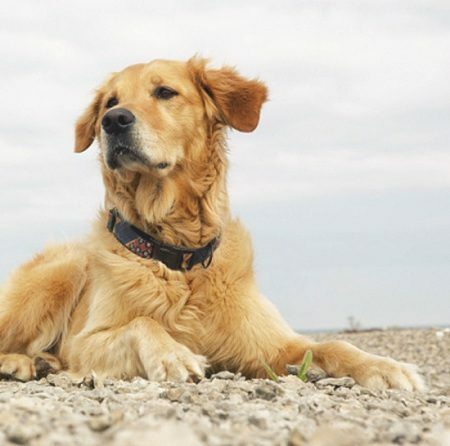 A hundred pounds of gamboling Golden Retriever, Burt had moved in with me seven years earlier, when I lived alone on the rural north Atlantic coast of the U.S. state of Maine. The summer after my marriage, he flew cargo to join my husband and I in Paris, where grass was scarce, but where a pair of soulful brown eyes could effortlessly finagle a lamb bone from the butcher or a baguette end from a sympathetic passerby. At the time of my son's delivery, the protocol for introducing an infant into a one-bedroom apartment already occupied by a demanding dog seemed like just one more challenge to add to an alarmingly long list. It turned out, though, that life with Burt has taught me a lot about life with a little kid. 1. Get outside. Go for walks. Kick a ball. Even when it's cold or wet. And you've got work to do. 2. Don't have too much work to do. Make time to roll around on the rug for no good reason. 3. Treats are no substitute for Quality Time. 4. Getting dirty is fun. But not everyone enjoys baths. 5. Cleaning up poop is no big deal. Vomit, on the other hand, will always stink. And now, three years later, it's my son's turn to learn from his late crumb-catcher. A new baby sister is on the way. Will he model his response on the good-humored resignation with which my dog accepted his infant intrusion into our lives? I'm not holding my breath. What is the most important life lesson your dog has taught you? Let us know - we'd love to hear from you! My dogs have taught the joy of a routine. They have taught me to accept and enjoy going out of doors whatever the weather and to relish games even in the rain (some thing I NEVER did at school…). They have shown me that a state of calm patience is the most effective way to clear communication. They have been emotional role models just by being themselves: eager, accepting, lively, gentle and loyal. Going Green With Your Dog – Can Dogs Be Vegetarians?